A jewelry box is often a treasured item, especially when it can play music. 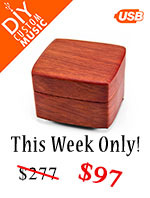 Here at MusicBoxAttic, we carry a variety of musical jewelry box styles. We guarentee we have a jewelry box that is perfect for you, a petite jewelry box, and others are large and feature a variety of jewelry compartments. You can purchase a musical jewelry box for yourself or as a gift. They are appropriate for all ages! Other music box companies may carry many styles of jewelry boxes, but they are often limited in song selection. Why should you settle for a song that you don't like in order to get the jewelry box design that you prefer? 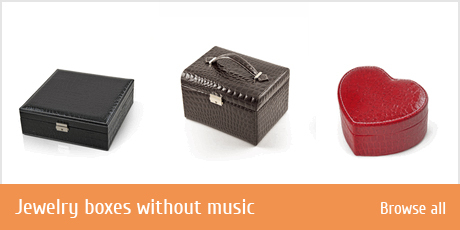 When choosing a jewelry box on our site, you can also choose from a large list of musical selections. MusicBoxAttic also carries jewelry box options that will play many different songs instead of just one selection. 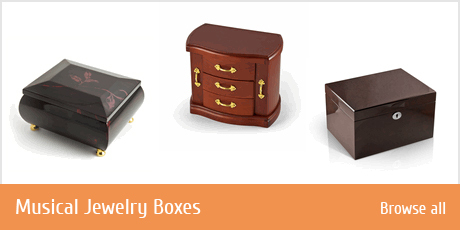 We offer many different designs and styles of jewelry boxes. A natural and glossy jewelry box with a wood finish provides a classic look. You can also purchase a jewelry box with inlaid designs or fabric coverings. 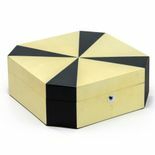 Most of our jewelry boxes feature velvet linings inside where jewelry items are stored. A jewelry box with velvet provides an elegant appearance, while also offering protection for delicate jewelry. Surprise your loved ones with an exceptional jewelry box from our dazzling selection of gift ideas. MusicBoxAttic also offers jewelry box options without music. A jewelry box like this is usually larger and has space for an entire collections of jewelry. Still offers all the luxorious perks of a musical jewelry box, a non-musical jewelry box could be what your looking for. Everyone wants to find the perfect gift, but sometimes, expert help is needed. MusicBoxAttic.com makes the process simple, with convenient online selection and purchasing. You can give a jewelry box to one person or many with a few clicks of your mouse. No celebration is complete without the perfect gift. 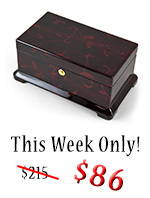 We offer a stunning selection of jewelry box options. Our luxurious jewelry box gifts . A wine wedding gift is classic, and elegantly appropriate for this momentous occasion. Wine lovers will be impressed with the quality and sophistication of a wine themed wedding gift from GiftTree. We carry vintages from the world's best vineyards, whose quality and taste are the epitome of luxury. These are wedding gift designs that leave a lasting impression. With GiftTree's one-of-a-kind, festive wedding gift ideas, the newlyweds will treasure your special gift until their golden anniversary. Send your warmest wishes with a keepsake wedding gift that is thoughtfully sweet and unforgettable. GiftTree's wedding gift selections also include unique and fun wedding gifts that you won't find on any registry. Bring additional romance to their lives with these elegant, amorous and playful wedding gift ideas. MusicBoxAttic can offer jewelry box options of differant designs to hold specific types of jewelry. Some of our smaller jewelry box designs might only hold rings or small items. Other jewelry box options have special drawers and compartments for holding earrings, bracelets, or necklaces. You may also prefer jewelry boxes with pillows for holding watches. 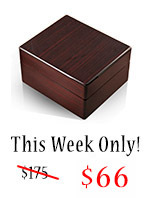 If you have searched for a musical jewelry box, you have come to the right site. MusicBoxAttic.com is the ideal place to find a wood jewelry box, wooden jewelry box, jewelry box wood, leather jewelry box, jewelry gift box, travel jewelry box, jewelry music box, vintage jewelry box, antique jewelry box, box jewelry, handcrafted jewelry box, ballerina jewelry box, jewelry box children, man jewelry box, child jewelry box, unique jewelry box, mens jewelry box, personalized jewelry box, Mele jewelry box, buy jewelry box, girl jewelry box, handmade jewelry box, necklace jewelry box, jewelry box manufacturer, or watch jewelry box. See our huge selection and pick the perfect Italian jewelry box, oak jewelry box, jewelry box or chest, Celtic jewelry box, white jewelry box, earring jewelry box, girls jewelry box, prayer box jewelry, or horse jewelry box for your loved ones or friends.